This week's recipe is from a diet cookbook with a difference. 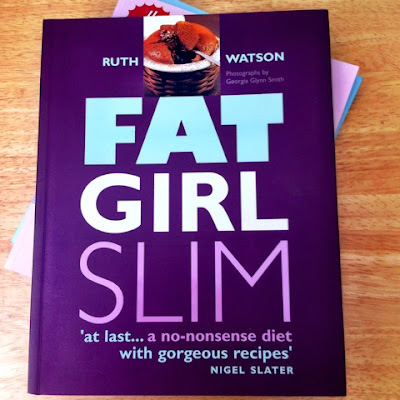 It's called Fat Girl Slim which is a great title and is by Ruth Watson. It's an entertaining read and doesn't have the same format as other cookbooks I have; it doesn't have the same kind of recipes either for that matter. In fact the last recipe in the book - in the chapter titled Sod it - is a hot bitter chocolate mousse and thick Jersey cream in case it all gets too much. The theory is if you're going to blow your diet you should at least do it with some style! There's also chapters titled Working woman's reality (with a sub-section devoted to "the packet queen"), Eating with your darling and Beyond baked beans. The other gem of advice in this book is "if you toss enough interesting vegetables with masses of Asian flavourings, I defy even the most raven carnivore to notice the absence of meat." I like lentils but am not very adventurous with them, or actually any dried pulse. I think that goes back to having to boil them for three weeks or so before you can eat them (perhaps an exaggeration there), or the hippy references in The Young Ones. Or that some need soaking overnight, which I forget to plan for. I've mastered red lentils, am ok with puy lentils and the lentils that come in a can are great to add to meals such as bolognaise or moussaka to bulk them out. But other sorts, less so. This recipe called for puy or umbrian lentils - well I had green lentils, which I had to double check the pack to make sure they didn't need soaking (they didn't). The thing I almost forgot having remembered the lentils, was to marinate the chicken - doh! But the recipe said to leave for 2-6 hours, so I think I just about scraped into the lower end of that time bracket. The marinade was natural yogurt, garlic, ground cumin, ground coriander, turmeric and chilli powder. For the lentils you needed a red onion (for some reason I used a white onion, despite buying a red one especially for this recipe), more garlic and a small red chilli. Then there's more spices - turmeric, star anise, a cinnamon stick and some cardamom pods, the lentils and stock and they're left to simmer until they're soft. 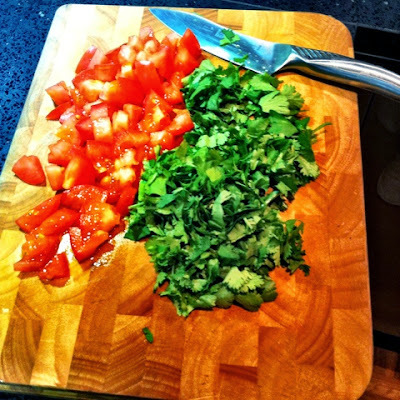 Then add in some roughly chopped tomatoes and coriander, stir and season. 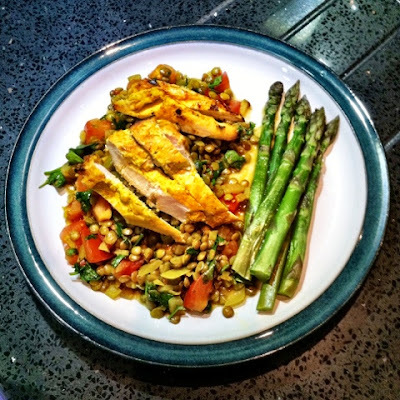 The recipe said to fry the chicken but as I'd used my frying pan for the lentils I popped the chicken in the oven to cook, which seemed an easier option (I still haven't built up my saucepan 'reserves' since switching to induction last year). The chicken was really tender and would be good cold in salads or sandwiches for lunch too. Or as I had recently on top of a pizza, along with cucumber raita (the raita was added after cooking, in case you're wondering). Neither of us were hungry after eating this, which is remarkable really as we ate this on one of our 5:2 fast days. I really must try harder to use dried pulses more often! apple & raisin oatmeal cookies.